It's been a while since I spoke about my foundation routine and what my favourite products are. I cannot live without foundation, it completely transforms my skin and just evens out my patchy complexion. 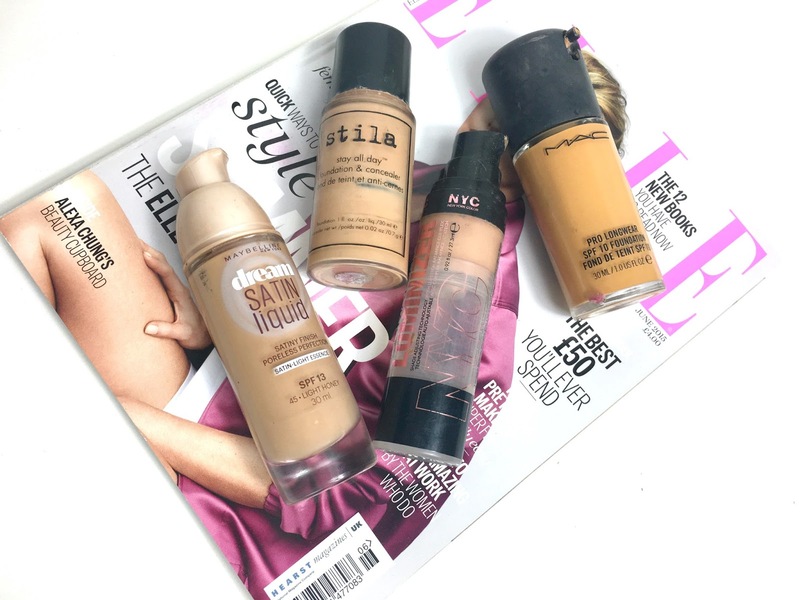 As I mentioned earlier this week in my money saving blog post, I do use quite a few foundations. I use the NYC Skin Matching Luminizer as my work foundation - I don't mind using this everyday while I'm at my desk and for £3 it really does create lovely coverage and a warm glow to my skin without needing to add anything else. If I am going on holiday or tanning at the weekend, I will use a dash of the MAC Pro Longwear liquid foundation. I actually bought this foundation at the airport and the MAC make-up artist was absolutely awful at matching my skin. I walked away with this shade and it is far too dark for my actual skin tone so to make sure it doesn't go to waste, I simply add a few drops to my regular foundation if I want to go slightly darker. I used this shade when I went to New York and although it blended perfectly and provided gorgeous thick coverage, it just looked far too orange on my skin. It can be so difficult to get the right formula/shade match. I usually blend Rimmel Clean Finish (love the finish but the lightest shade is too dark for me) with the Maybelline Better Skin (right shade)! Foundation should be matched with the nature of the skin, but most important thing is that the color of the skin of an individual.The domywriting in the right track of a lifestyle routine so that each an every inspiational speech manke them motivated.The quality of the foundation is important befor choosig the product for the individual.